The company has become more of a player, but it's still struggling. Frontier Communications (NASDAQ:FTR) has gone from a small regional player in the pay-television and broadband space by buying Verizon's (NYSE:VZ) wireline business in California, Texas, and Florida (CTF) for $10.54 billion. That major deal brought the company approximately 3.3 million voice connections, 2.1 million broadband connections, and 1.2 million FiOS video subscribers. It was a transaction that the company undertook to increase its scale as well as help it gain efficiencies. That part of the CTF purchase has been successful, with Frontier on track to save nearly $1.5 billion annually across its entire operation. Both the Verizon deal and the associated cost savings have been well covered in media, and investors even casually following the brand know what's going on there. The company does, however, have a number of things that many investors, even shareholders, may not know. Not every one of these items will surprise everyone, but each one tells a piece of Frontier's story that perhaps hasn't been covered as much as it should have been. Since the Verizon deal closed a little over a year ago, Frontier has been struggling, and its share price has been going steadily in the wrong direction. To keep the company in compliance with the Nasdaq, where its share are listed, the company's board has authorized a reverse split, which shareholders will vote on in May, according to the company's Q4 earnings release. "The charter amendment will provide for a reverse stock-split ratio between 1-for-10 and 1-for-25, with the board designating the final ratio within 90 days after the charter amendment is approved by stockholders," the company wrote. "Concurrent with the reverse stock split, the conversion ratio of Frontier's Series A 11.125% Mandatory Convertible Preferred Stock will automatically be adjusted proportionately." Old-school landline phones are Frontier's second largest source of revenue. Image source: Pixabay. While most analysts and journalists covering the company focus on broadband and pay television subscriber counts, Frontier still relies pretty heavily on revenue from what it call "voice services." That category, which is what is now commonly referred to as "land lines," was the company's second largest category in Q4. Voice services brought in $774 million for the period, behind only data and internet services, which came in at just over $1 billion for the quarter. Like the company's cable and broadband segments, its landline business has been shrinking as well, dropping by $34 million in revenue from Q3 to Q4. While it's common in the wireless-phone space to offer incentives to customers willing to switch providers, the tactic is less common in cable and broadband. That may because in many markets the incumbent carrier has never had any real competition, and the alternatives, such as satellite, have chosen to use price as their main marketing factor. Frontier, however, has often been willing to pony up for customers willing to make the switch. Currently, it's running a promotion in which new customers can receive an Amazon.com gift card for up to $400. To get that amount, the consumer will need to bundle the company's top-tier cable and broadband services, along with a phone line, but smaller amounts are available at a variety of pricing tiers. In most cases, getting the incentive requires agreeing to a two-year contract. 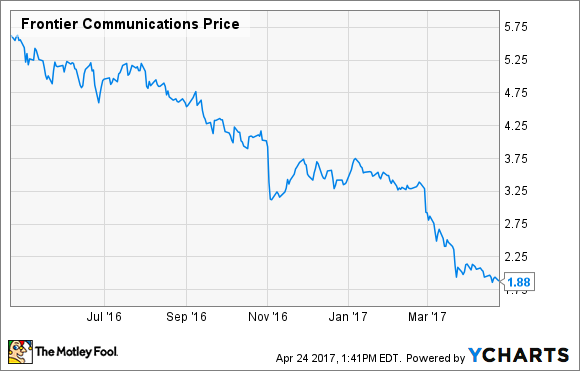 Frontier Communications has seen its stock tumble over time, and many investors simply dismiss the company then and there. But the details of what's been happening with Frontier's business give a lot of insight into the reasons behind the slide, and that can be helpful for shareholders thinking about what to do next.